Independence Day in Papua New Guinea is celebrated on September 16. This public holiday commemorates the country's independence from Australia in 1975. Papua New Guinea (PNG) is located in Oceania. Throughout its history, it was ruled by three countries: Germany, the United Kingdom and Australia. The Colony of German New Guinea was established in 1884, it comprised the northeastern part of the island of New Guinea. The rest of the island was a British protectorate. In 1902, the UK placed British New Guinea under the authority of the Commonwealth of Australia. German New Guinea was seized by Australia during the First World War. In 1920, the League of Nations created the Territory of New Guinea and granted Australia a mandate for governing it. After WWII, the Territory of Papua merged with New Guinea, forming the Territory of Papua and New Guinea. In 1971, it was renamed Papua New Guinea. 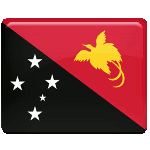 Two years later, PNG became self-governing. It was granted full independence on September 16, 1975. PNG Independence Day is marked across the country with flag hoisting ceremonies, official speeches, folk singing and dancing, craft fairs, canoe races, and other events and activities. The main ceremony is held at Independence Hill in the capital city of Port Moresby.